The deadly sin of tough conversations is going halfway. Discomfort causes some leaders to cut them short. Work up enough courage to dance with tough issues long enough to do some real good. Pointing out a problem is helpful, but doesn’t solve it. Bringing up an issue doesn’t mean others understand it. Telling someone what to do, doesn’t mean they share your vision. Compliance isn’t commitment. Ambiguity produces a false sense of success that results in collisions of expectation. The only thing more important than bringing up tough issues is working them through to useful conclusions. Always step toward ambiguity and confusion, don’t ignore it. What talents, skills, or qualities are most important as we move forward? Explore key factors for success. How will we/you/I make this better? Talk helps. Action is better. How have we connected with the big picture? What’s clear that was confusing? Ease, at least in the beginning, trumps difficulty. What questions come to mind? What points of reluctance might you feel when you think about next steps? What has turned this into a positive experience? Bonus: Project yourself into the future. What are the reasons we succeeded? Feeling uncomfortable with tough conversations may cause leaders to short-circuit success by cutting them short. Be brief and direct at the beginning of tough conversations. Agree on the reason for the conversation. Slow down at the end. Pursue clarity with kindness. 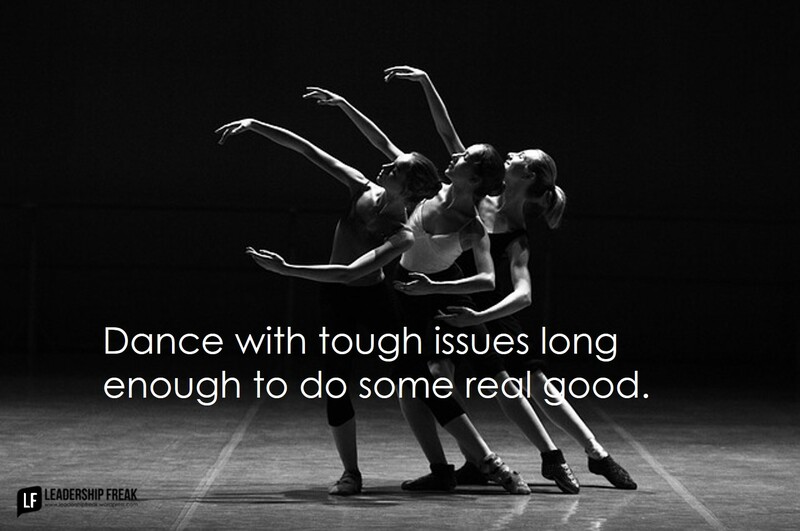 How might leaders dance with tough issues long enough to do some real good? Dan, “Work up enough courage to dance with tough issues long enough to do some real good” is an excellent phrase. However, 80% of managers and excecutives do not have the requisite talent to do it successfully. Thanks Bob. I wonder about the pros and cons of “learn as you go” when it comes to tough conversations? I really appreciate the points made in “Halfway makes matters worse” section. I find myself coming to a conversation prepared with a few questions/statements, when I’d be better prepared to seek a product from the conversation.. The product opens the door for the follow-up’s you suggest. Thanks Ken. You reminded me of “Begin with the end in mind.” In this case, begin with the outcome/result/product in mind. Another great post to share. Before you bring up opportunities to improve you must make sure your leaders have the emotional intelligence to handle it. Leaders with high EI just want to win, no politics, no pride of authorship they are leaders singularly focused on increasing shareholder value. Those folks I love to help as I shared in a post years ago…If you want to add value to your bottom quickly hire a heretic http://www.nosmokeandmirrors.com/2009/04/10/want-to-add-value-to-your-bottom-line-quicklyhire-a-heretic/ . The most difficult to help are the” this is how we have always done it crowd”. I try to explain how you did it 15-20 years ago was smart then, but things change and we must pivot. Like you said we need to bring problems into the light of day and work together to solve them. Thanks Mark. I’m glad you brought EI to the conversation. Research continues to demonstrate that EI is more important than IQ as long as you’re reasonably intelligent. So many times halfway becomes the leader sharing feedback with their staff but not engaging or allowing the opportunity for the return conversation. Telling others, not conversing with others. In cases I have seen, there are “Directors” who live in that name and status. They see Accountability as a measure of getting their responsibilities accomplished in time and their comfort with sharing issues with their direct reports. They over estimate their conversation competence by believing that as a Director their half of the conversation is enough. There is ego that if I am a “Director” I have exhibited competence. All 4 of your points above under “halfway”. Thanks Will. Your comment has real punch. I think you’re right. Some leaders believe telling/directing is conversing. Love how you put that. Your comment reminds me of the importance of healthy leadership practices like listening and relationship building. When leaders think telling is a conversation they grow more and more out of touch. People stop trying to give them alternative view points. Team energy goes down. The more a leader tells, the more they need to tell.